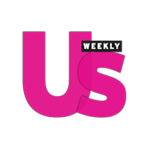 It is time to continue letting my guys and gals know where else I went on my Britney Pilgrimage in Las Vegas a few months ago (sorry I have been on a hiatus working on a few fab projects but I am back now)! This is perfect timing to help you make dinner plans for when Britney hits the stage again for her 'Piece of Me' show at Planet Hollywood on August 15th. Not to mention summer time is Vegas Season (I am loving those commercials on T.V.)! The night of the show I was so excited to see Queen Britney that I did not want to risk being late at all. Luckily I was able to stay the weekend of my trip in Planet Hollywood (I highly recommend doing so) so getting to the show was so easy! I knew that before I went and danced the night away and screamed my head off that I needed some amazing food to give me lots of energy. It would not be cute at all to fall out during the Britney show! Thank goodness that Strip House is conveniently located in Planet Hollywood. A look at Strip House Planet Hollywood in Las Vegas' dining room before it gets packed with hungry guests. Strip House Steakhouse offers an innovative approach to American classics with prime cuts of beef charred to perfection, signature side dishes, an extensive wine list and the famed 24-layer chocolate cake. The double entendre name refers to the restaurant's signature cut of steak and to the series of early 1900's Studio Manasse black and white nudes that amplify the sultry ambiance. Set by the perfectly paired siren red interior and modern twist to old-world glamour, the collision of sophisticated styles provides the central concept of Strip House's aesthetic design. Let's take a look at some of the delectable dishes that I had a chance to try! When I sit down at a nice restaurant and prepare myself for an amazing meal, I love to start with an amazing cocktail and some Tuna Tar Tar. 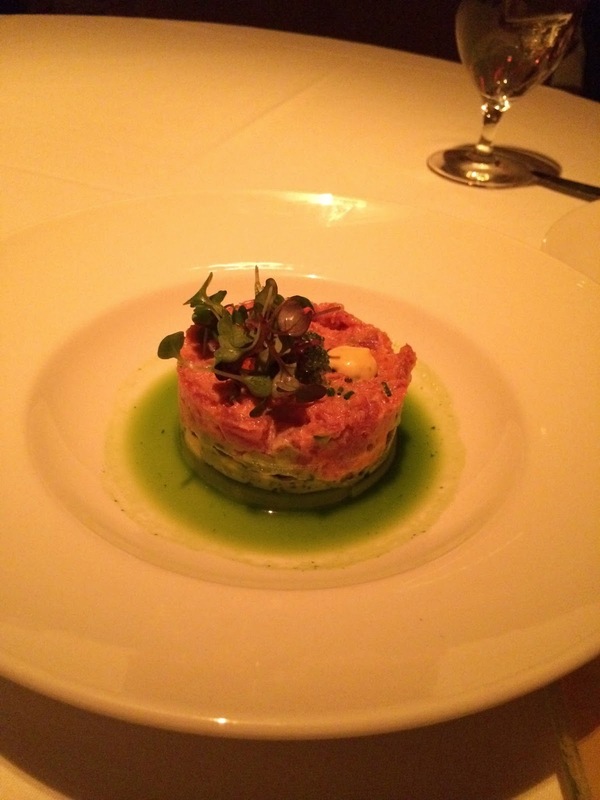 Strip House has delicious and fresh spicy tuna tar tar that is perfect to start the meal off. 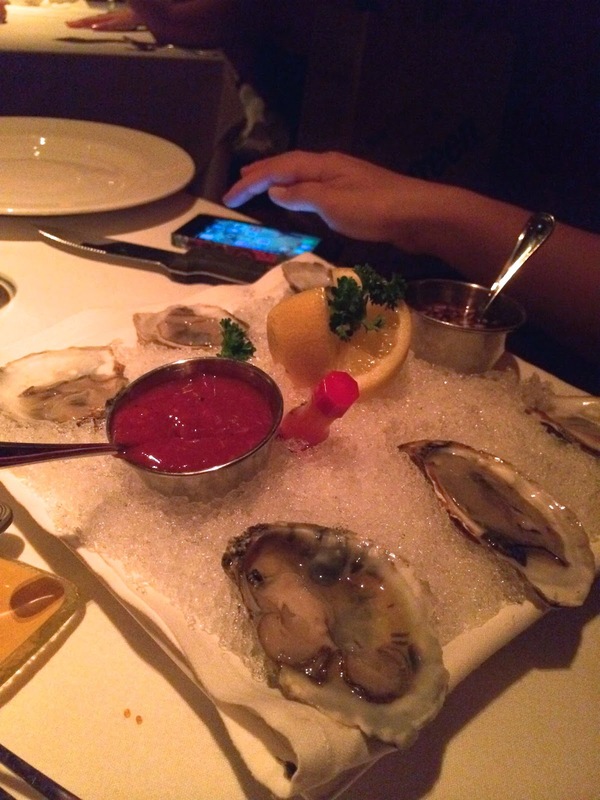 My friend and dinner guest, Sabrina Chapman opted to try Strip House's oysters on a half shell that were equally as tasty and fresh. It is always nice to find amazing seafood when traveling. On the night that I dined at Strip House the special was steak and lobster. I decided to get this because it was the perfect way to try two things that I love. The steak was cooked to perfection according to my liking (medium rare) and the lobster was very tasty and fresh. I keep harping on the fresh part because there is nothing worse than getting seafood that tastes like seafood (you know that I mean). Going back to the steak, I used to always get my meats and steaks well done but over the years several people have told me that it is basically a sin and a travesty to go to a great steakhouse and not get at least medium. I have to say that I totally agree now and this was the perfect occasion to enjoy steak how it was meant to be enjoyed. It also gave me much needed protein for the Britney show as mentioned before. 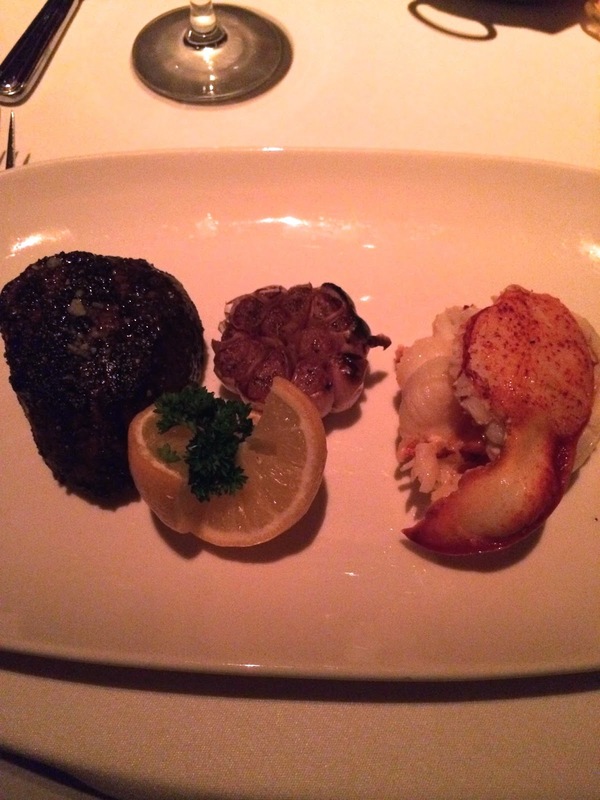 The steak and lobster is just one of the many options that Strip House offers. Corporate Executive Chef Michael Vignola, who also oversees three New York City Strip House locations, has crafted a full menu that allows diners to indulge in rich dishes and perfectly seasoned red meats, boasting many house specialties. There were also amazing side dishes that I am still having trouble getting over! I love when I get to try restaurants out and the waiter brings out the best of what the place has to offer. This was the case with the Strip House side dishes. 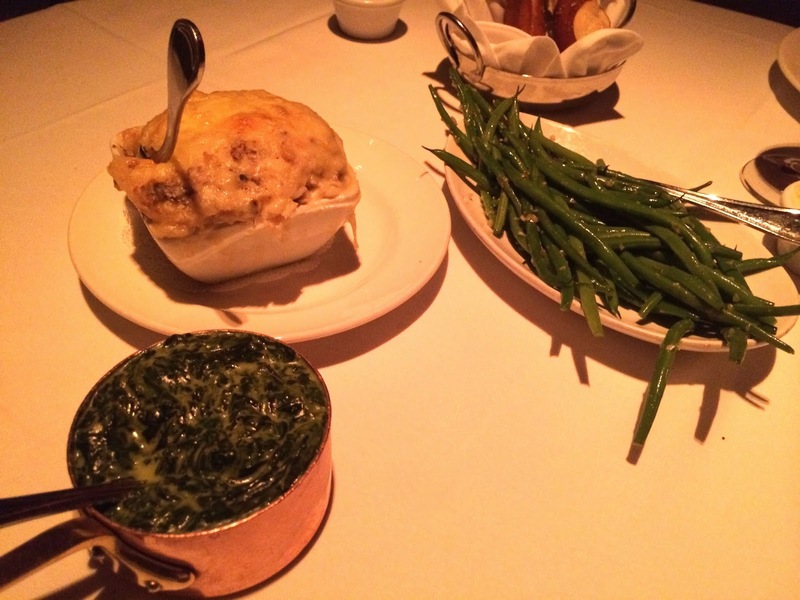 The waiter brought out the most amazing mac and cheese that was baked to perfection and melted in your mouth, along with sautéed green beans (I love green beans) and black truffle cream spinach. I really don't have to say more that "black truffle cream spinach" because that should be more than enough to let you know that it was heaven and full of flavor. I am a big spinach fan and a big truffle fan so this side dish was paradise and I highly recommend that you order it when you go to Strip House in Planet Hollywood! Strip House also has refreshing cocktails and a fabulous wine list which we sipped on during the meal. If and when you do go to Strip House before the Britney 'Piece of Me' show I strongly encourage you to save room for dessert. This may be a hard task but it is just something that you have to do. "What happens in Vegas," right? 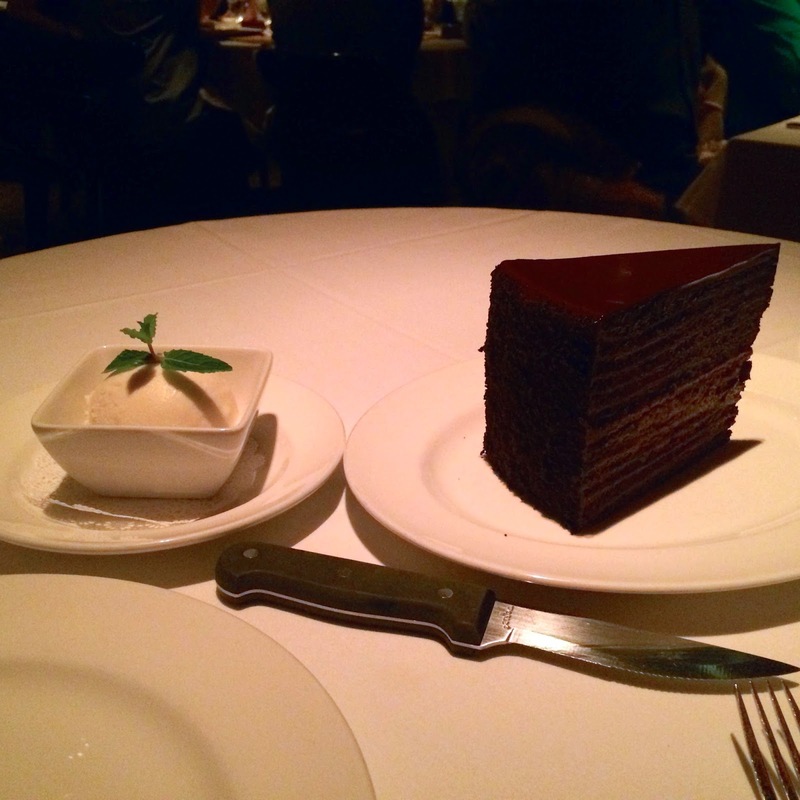 The above photo would be why you simply have to order dessert! 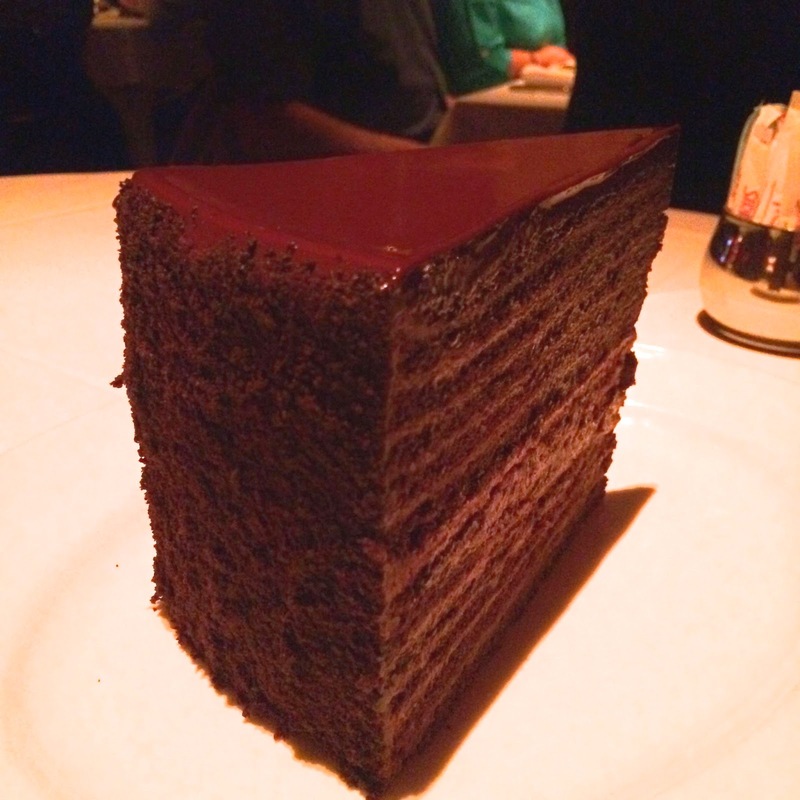 The Strip House Chocolate Cake has been recognized on the Food Network's show "The Best Thing I Ever Ate" and boasts 24 layers of delectable chocolate goodness in each 1.7 puns slice! If you are a chocololic than this is the ultimate dessert for you! 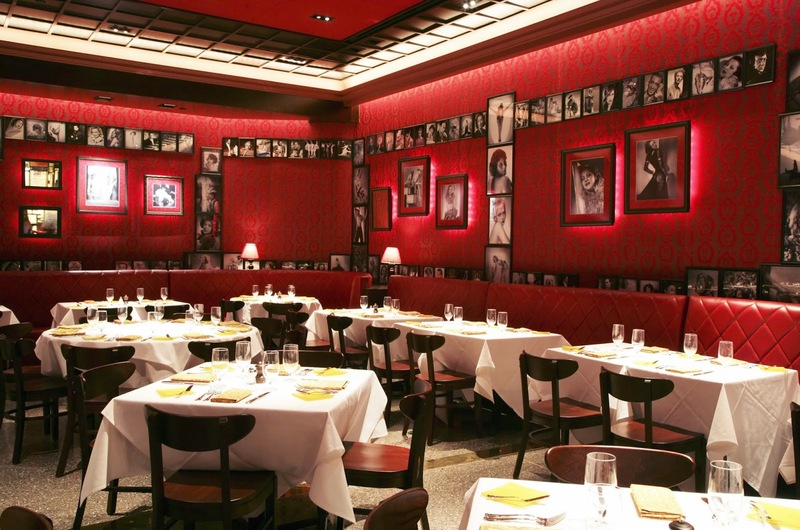 Strip House is the perfect place to have dinner before seeing Britney's 'Piece of Me' show. It is located in Planet Hollywood so you do not have to worry about being late due to traffic on the strip. The staff is attentive and quick ensuring that you have enough time to enjoy your dinner and not be tardy for the Britney Party. Special thanks to Strip House and Magnetic Public Relations for having OJ&B for dinner! I will have to check out the NYC locations soon! P.S. 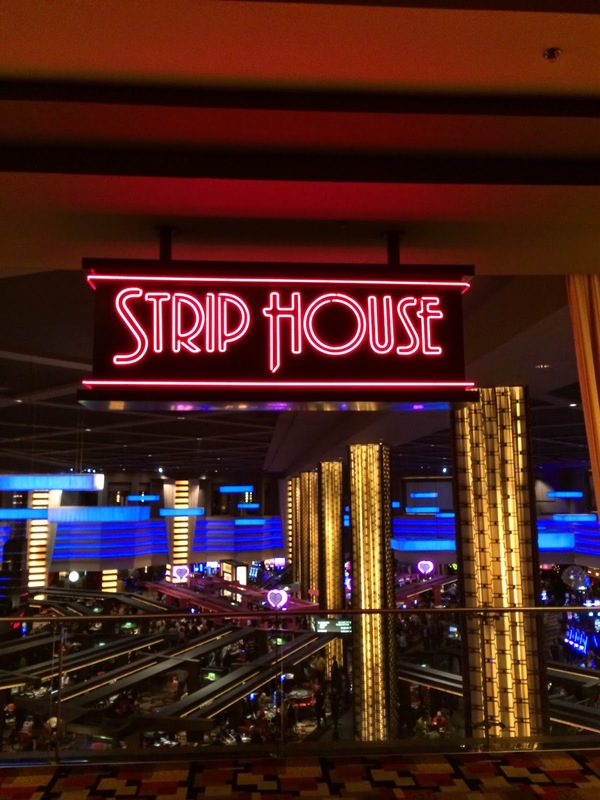 If you are planning on going to see Britney or simply are taking advantage of Vegas Season then be sure to make your dinner reservations for Strip House today!